Take this moment now to don that cowboy hat because the air will be filled with the sounds of legit country music. 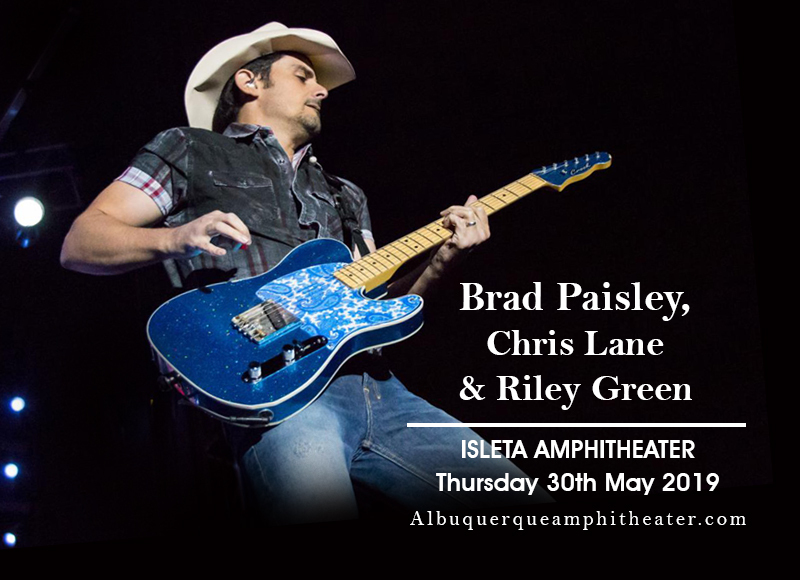 Not one, not two, but three country music superstars will seize the stage at the Isleta Amphitheater on Thursday 30th May 2019. Heading the pack is country music hottie Brad Paisley, along with his country cohorts Chris Lane & Riley Green. This stellar show is one that true blue country music fans cannot afford to miss. The mere mention of these names alone will send country music fans on a buying frenzy to get their hands on tickets to the show. Get on moving without leaving your seat. All it takes is to click ' buy tickets', then you're in for the time of your life. Book your tickets right here, right now! One of the first artists to come to mind when speaking about country music is Brad Paisley. He's been playing country music since he was 13 years old. He may have considered himself kind of late in the game when he released his debut album ‘Who Needs Pictures’, in 1999, at the age of 26. But when dreams do come true, the passion is unstoppable, and the rewards are unimaginable. Brad Paisley may have been a late bloomer, so to speak, but nothing could stop his winning streak. He has sold over twelve million records worldwide, to his name. He is a three-time Grammy Awardee for Best Country Instrumental Performance and Best Male Country Vocal Performance for songs like "Throttleneck," "Cluster Pluck" and "Letter to Me.” He is a recipient of two American Music Awards; then was bestowed with the ultimate honor of American country music having – being the youngest inductee member of the Grand Ole Opry in 2001. Sharing the stage with Brad Paisley on this tour are fast-rising country star Chris Lane, along with former CMT reality show Redneck Island contestant Riley Green. If you love country music, chase-up on those fast moving tickets before they run out.